Since Tudor times small boys from the well-off classes had been dressed in their early years in exactly the same clothes as girls, often until the age of six. The process of ‘breeching’, when the boy shed his petticoats, was a proud family occasion. At this time a boy would finally be dressed in a smaller version of adult clothes. 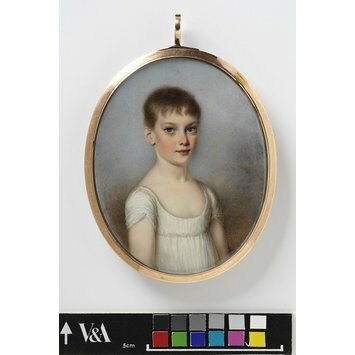 By 1800, when this portrait was painted by Hazelhurst, the situation for children was changing: boys usually graduated out of dresses at about four years old. But the Right Honourable J. 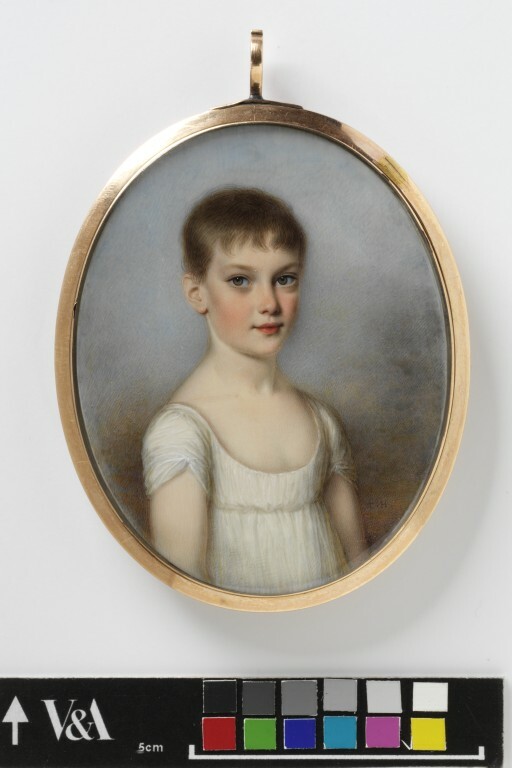 A. Plantagenet Stewart, seen here, would seem to be about eight. His dress closely resembles the standard dress worn by girls at this time--white muslin, high-waisted, and with a low drawstring neck and short sleeves. For girls this loose form of dress marked a revolution in freedom compared with the corsets and frippery of earlier years. But it seems somewhat unfortunate for a boy to be dressed at such a late age in this feminine style.